The Shawanathon is a multi-leg endurance challenge that takes place annually in the Shawangunk Mountains surrounding New Paltz, NY. If you’ve never heard of it, that’s because it is a small, but very competitive, invitation-only event. This year 13 racers toed the line in jorts (aka jean shorts), the mandatory race attire, with some competitors adding optional costume elements. Every year the race course and events are different. 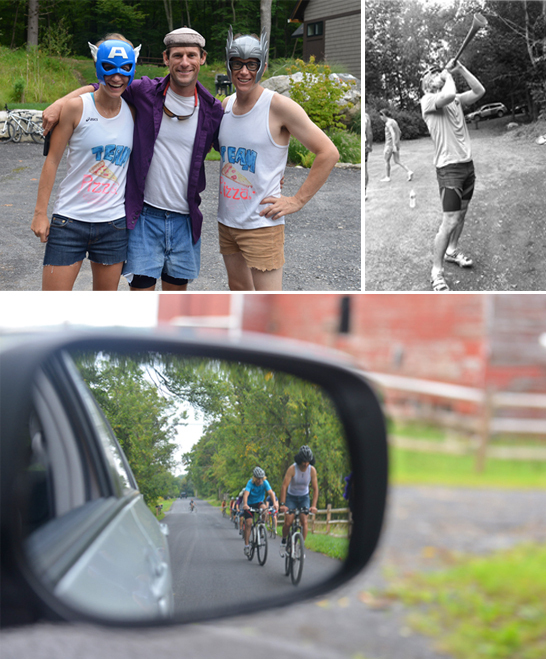 This year’s race was made up of two kayak legs, 4 miles of trail running, a 5+ mile mountain bike, and finished up with a special challenge –jousting. Following the race is a big Athlete Food BBQ. After DNF’ing last year’s race, I was pretty determined to get on the podium this year. Things were looking pretty grim for my podium prospects after the first kayak leg. I selected what I thought was the fastest kayak, but my inexperience with paddling caused me to have major steering problems. A few minutes into the race, all I could do was watch the rest of the field power further and further away. SJ helped me position the boat and lowered the skeg and I was able to regain form and challenge Gene (Mr. Charity Miles) for an 8th place finish. During the transition to the 2nd kayak leg, I got a quick lesson from paddling legend, Dan Winfield. Thanks to Dan’s tips, I was able to turn things around and finished the next paddling section in 2nd, behind Dan. My biggest competitors for the podium, Mark and Lino were just about 20 seconds behind, impressive because they were paddling a big, heavy canoe with Maya in it. This turnaround on the kayak gave me some hope that I might be able to come from behind and pull off a podium finish - but it wasn’t going to be easy! The next section involved running, which hasn’t exactly been my strong suit lately. I had to make sure I finished first in the two running sections to give myself a chance, but Emily, Meghan and SJ/Maya weren’t going to let that happen without a challenge. I had to run my fastest “workout” of the year to win the two runs – averaging about 6:15 pace, about 1000% humidity and wearing jean shorts. After sitting in a kayak for over an hour, that was not easy. I wasn’t sure how I was going to feel on the bike, but I knew I had to find another gear if I was going to try to win. For the first bike leg, which was totally flat, I hung back and then attacked with a few minutes to go and was able to pull off the win, just ahead of SJ and his fat bike. Meghan would have been right there, but her bike got stuck in the granny gear and she ended up falling behind. 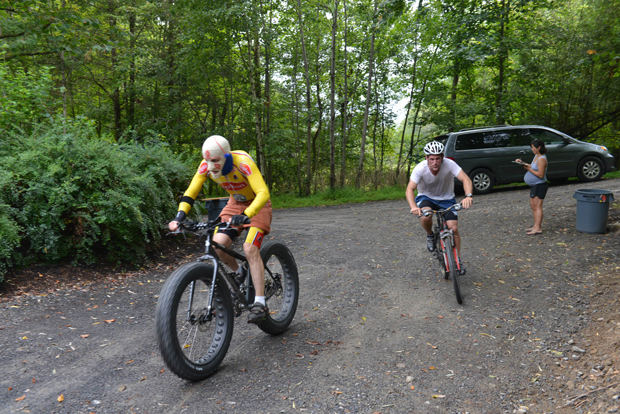 The second bike leg was hilly and Tom took the lead, hoping for the stage win. I got him at the very end and was able to transition to the jousting ring first. I definitely raced way above my training level and was totally spent by the time the BBQ started. Nichole and Maggie’s peanut butter squares and three ZICOs turned things around. As always, we had a funny awards ceremony, lots of good food, and lots of fun.